Including cerebral cortex, basal ganglia (often called the striatum), olfactory bulb, etc. Including dentate nucleus, interposed nucleus, fastigial nucleus, and vestibular nuclei. Including thalamus, hypothalamus, etc. and the posterior portion of the pituitary gland. Including pons, substantia nigra, medulla oblongata, etc. The numbers of neurons varies extremly between species: the common fruit fly has about 100.000 neurons, whereas it is estimated that the human brain has about 1014 (100 billion) neurons. However these are estimates, nobody ever counted all the neurons, or delivered a plausible concept how to estimate their number. But, just to remember you, how wrong sience can be: it was printed in almost every biology / medicine text book, an often used question in tests, and broadly regarded as a fact for decades - that the human genome has about 100.000 genes. Until of course, the genes where actually counted: turns out, their number is about +/- 25.000 in humans and +/- 30.000 in mice. The bulbous part of a neuron is called the soma (or perikaryon), and contains the cell nucleus. The word soma is Greek, meaning "body". From the soma, one axon ( a “cable-like” projection), often myelinated, extends, which propagates signals to other cells (neurons, muscle, etc.). The axon forms synapses at its terminal part, when it its “contacting” other cells. The soma is also covered by dendrites, which in most case are the “receiving” entity, which are connected to axon terminals of other neurons. It was long postulated, that in the adult mammalian brain, no new neurons are "born". However, it has been shown in humans and in mice that this dogma has been wrong. The function of the brain is based on the ability of excitable cells to trigger and transmit electrical impulses. 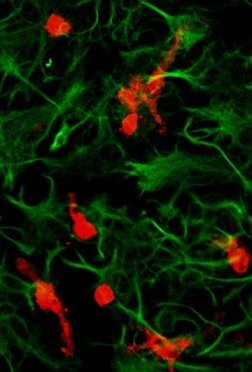 Against this background, it is maybe surprising, that the electrically excitable cells - the neurons - are numerically outnumbered by the so called glial cells within the central nervous system (CNS). In recent years it has become increasingly clear, that these glial cells also take over other functions in the brain. They may communicate in a sort of network which complements and or supports the neural network. Likewise, the clarification of the ontogeny of glial cells is still a topic of research in neurobiology. Astrocytes belong to the 3 types of glial cells in the CNS (the others are microglia and oligodendrocytes). Astroglia is used as a synonym. 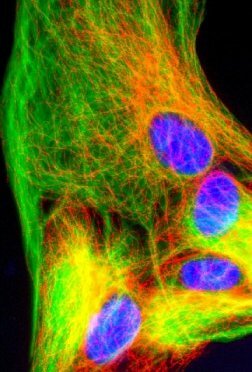 These cell exhibt usually a star-shaped mmorphology, with many processes extending from the soma. Astrocytes can be identified histologically since they express the intermediate filament glial fibrillary acidic protein (GFAP). 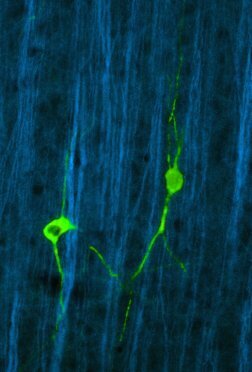 a "guidance" for growing neurons / axons during the development of the brain. Previously in medical science, astrocytes have not been given an active role in the information processing activity of the brain, but this view has recently been challenged. The cell body (not the branches) of the oligodendrocytes exists predominantly in the white matter, less frequently in the gray matter. The degeneration of the myelin sheath, which is formed by oligodendrocytes, is a characteristic morphological change in the disease multiple sclerosis. The name microglia was first (1920) introduced by Pio del Rio-Hortega (1882 – 1945). Since the function and ontology of microglia was unknown at that time, and furthermore, the cells of the brain where divided into two types: neurons and “others”, which were termed by the generic expression “glia” (e.g. astroglia and oligodendroglia ), the term microglia was a reference 1. to their shape 2. to their obviously non-neuronal characteristics. Once activated, microglia assume an amoeboid (round, oval) morphology, and display a behavior similar to macrophages. They act as antigen-presenting, phagocytic, and cytotoxic cells, all three a hallmark of cells of the immune system.